In Italy we believe that the secret to living well is eating well. Simple, tasty and versatile, Pasta is a pillar of the Mediterranean diet, one of the most well-known diets in the world. Enjoy it with your favourite ingredients or just add a tomato sauce for a meal that everybody will love. Since our beginnings in Parma, Italy, in 1877, four generations of the Barilla family have been passing down the secrets to producing great quality pasta that really does cook and taste better. 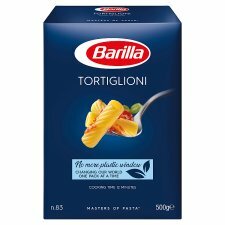 Barilla, made by Italians. Paired with your favourite Barilla pasta shape, it's the easiest way to bring the taste of Italy to your table. Step 1: Add pasta to boiling salted water. We recommend 1 litre of water and 7g of salt for every 100g of pasta. Step 2: For authentic »al dente» pasta, boil for 12 minutes, stirring occasionally. For more tender pasta, boil for an additional minute. Step 3: Drain well and serve immediately with your sauces. Imported by Euro Food Brands.